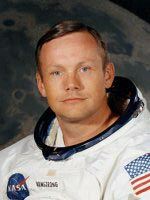 Everyone knows that Neil was the first man to step foot on the moon, but did you know that the Apollo 11 Command Pilot, Neil Armstrong, then 38, could have missed his destiny as the result of half a dozen close shaves. During the Korean War, he crashed his Panther jet behind enemy lines, but escaped a day later (he won 3 Air Medals in 78 combat missions). As a civilian test pilot in 1962, he plummeted uncontrollably toward earth when the rocket engine in his X-15 failed to start, but it fired up just in time. As the commander of Gemini 8 in 1966, he had to abort the scheduled 3-day flight after 10 hours when a short circuit threw the spacecraft's thrusters out of control. And the summer before he landed on the moon, he had to eject from a lunar-landing research vehicle at an altitude of only 100 ft. when it spun out of control and crashed. Neil took his first airplane ride in Ford Tri-motor when he was just 6 years old. He worked part time in a drugstore, and as a grease monkey at a local airfield to save enough money for flying lessons. He earned his pilot's license at age 16, but he had to ride his bicycle to the airfield because he didn't yet have a driver's license. After his flight to the moon and back, Neil was the recipient of many special honors, including the Presidential Medal for Freedom in 1969; the Robert H. Goddard Memorial Trophy in 1970; the Robert J. Collier Trophy in 1969; and the Congressional Space Medal of Honor, 1978. 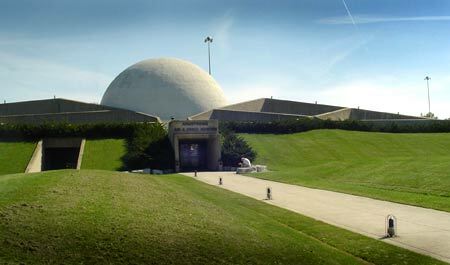 The Neil Armstrong Air and Space Museum, located just off I-75 in Auglaize County, is a treasure trove of memorabilia from the first man to set foot on the moon. But while Armstrong is the dominant figure, thanks to some recent renovations, many exhibits are designed to give visitors a better perspective on the history of space travel and the politically charged space race of the 1960s. The Armstrong Museum is located just west of I-75 at exit 111 (Bellefontaine Street) in Wapakoneta. Tuesday 9:30 a.m. - 5:00 p.m.
Wednesday 9:30 a.m. - 5:00 p.m. Holidays 12:00 p.m. - 5:00 p.m. The airport where Neil Armstrong received his first flying lessons, now named in his honor, located in New Knoxville: Take I-75 south to U.S. 33 west. Follow U.S. 33 to County Road 25A and turn left. Travel 4 miles to SR219 and turn right. The airport is approximately 7 miles from the intersection.